The image most people have of Mohandas Karamchand Gandhi is probably that of Ben Kingsley's portrayal of him in Richard Attenborough's magnificent 1982 film "Gandhi." The film depicts the 1893 incident where Gandhi, in western dress, is ejected from a train in South Africa for being in a whites-only compartment, despite his having a first-class ticket. The incident, and subsequent ill treatment by whites, is described on Page 68 of Ramachandra Guha's "Gandhi Before India" (Knopf, 688 pages, photographs, maps, notes, index) the first volume in a two-volume biography of the man known to the world as Mahatma ("Great Soul") Gandhi. No movie -- not even the much honored "Gandhi" (it won eight Academy Awards, including Best Picture) -- can depict a person's life as thoroughly as biographies like Guha's, which show that South Africa was a defining point in Gandhi's life. In his two decades in the country, from 1893 when he went to South Africa as a 23-year-old lawyer on a legal matter, to 1914 when he left the country for good, returning to India in 1915, he formulated the non-violent resistance doctrine that he later used in his native land. Guha shows how Gandhi drew on Western sources, from Henry David Thoreau to John Ruskin to Leo Tolstoy to create the doctrine known in his own Gujarati language as satygraha. 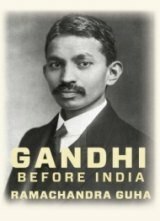 Guha's very readable and thoroughly documented biography takes us from Gandhi's birth in Porbandar, Gujarat in western India on Oct. 2, 1869 through his early education and his two years as a law student in London, where he discovered that not all whites were as mean-spirited as some of the South Africans he would later encounter. Guha has uncovered many previously untapped documents, including private papers of Gandhi’s contemporaries and co-workers; contemporary newspapers and court documents; the writings of Gandhi’s children; and secret files kept by British Empire functionaries. Early on Gandhi demonstrated his skills as a community organizer, working on behalf of the Indians and Chinese in Durban, Natal. He labored to eliminate discriminatory taxes and identification papers on what the whites in the colony called "Asiatics." His efforts attracted the attention of Christians, Muslims, Buddhists and especially liberal Jews, who saw in Gandhi a leader who worked to eliminate the discrimination that they had experienced in Russia and other European countries. Indians in all the South African colonies -- Natal, Cape Colony, Transvaal and Orange Free State -- were seen as a threat to white dominance because of their determination and devotion to education. This was seen by his Jewish friends: Hermann Kallenbach, Henry Polak, L.W. Ritch, and Sonja Schlesin, his long-time secretary, as parallel to the Jewish experience. Guha shows how journalism played a big role in Gandhi's development; his lack of public speaking skills were more than made up through his editorship of his newspaper Indian Opinion, and his other journalism efforts. He was also an able persuader in his capacity as an English-trained barrister, even convincing powerful leaders like Jan Christian Smuts to modify some of the more blatantly discrimination toward Indians. The author explores Gandhi's personal life, including his complex relationship with his wife, Kasturba; his often contentious relationship with his sons and his devotion to ridding his life of possessions to concentrate on his ultimate goals of freedom. The final chapter in Guha's biography, Chapter 22 "How the Mahatma Was Made", starting on Page 530, might be a good start for readers who wonder if they have the stamina to read the book from the beginning. It's a good summation of the book and should inspire hesitant readers to start at the beginning. My understanding of a great man with whom I share an October birth date was greatly enhanced by reading "Gandhi Before India." I think many readers, especially those who love biographies as I do, will learn much from this outstanding book. Ramachandra Guha has taught at Yale and Stanford universities, the University of Oslo, the Indian Institute of Science and the London School of Economics. His books include a pioneering environmental history, an award-winning social history of cricket and the award-winning "India After Gandhi". He writes regularly on social and political issues for the British and Indian press, including columns in The Telegraph and the Hindustan Times, and his work has also appeared in The New York Times. He lives in Bangalore.